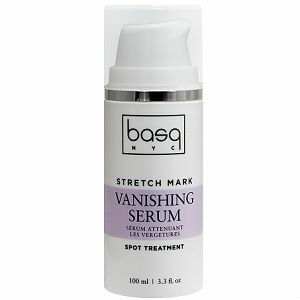 Here we have for you a review of the Stretch Mark Vanishing Serum from Basq NYC. Since you’ve found your way here, it’s likely you already know all about what stretch marks are, and where they appear. You also probably know that it can be a minefield out there in the search for the right product. The serum aims to treat the source of stretch marks deep beneath the skin’s surface by targeting damaged cells with clinically tested ingredients. To know more just keep reading. This product seems really promising. The active ingredients include regestril, a fairly new compound which targets the cell matrices, producing far more natural collagen in the areas it is applied to. This leads to the appearance of a slowing of the aging process, with an increase of elasticity, and removal of the colouration that make stretch marks so noticeable. This ingredient has really impressed the online community for doing exactly what it says it will. The recommendation is to apply twice per day by massaging into the skin for 30 seconds per affected area. It is safe to use Rutin and Regestril, though side effects may be experienced. In general with more potent products like this one you should stick to the 8 week course, and not be tempted with long term use. Use of Rutin in high enough doses can cause headaches, nausea, stomach upset, rashes, and flushing. There is not yet any reliable research to be sure that Rutin is safe during pregnancy, so you should avoid use for now, and in general stick to the 8 week course. The price is $44 per 3.3 oz, and the delivery is fairly pricey at $9. However if you’ve tried products without such potent active ingredients and had no luck then this certainly might be worth a try. There is little information online about the manufacturer’s warranty, you are advised to contact their customer services for more information. A user comment implied it was only guaranteed against faults, and would not be refunded after use, which is disappointing. Honest manufacturers will tell you that there is no certainty that any one product will work for everyone, and many products on the market have no proven active ingredients at all, though this is certainly not the case with the Basq NYC Stretch Mark Vanishing Serum. Unfortunately little information is available from them as to whether the dose is safe for use during pregnancy. As for the guarantee they seem to hide their (non-existent) policy, which is peculiar. All in the price comes to $53 for a little 3 oz container, which is definitely on the more pricey side. As a result you may be better off searching a bit more for a stretch mark product. David Carney	reviewed Basq NYC Stretch Mark Vanishing Serum	on August 4th	 and gave it a rating of 2.5.